When a customer wants to borrow money from the bank, a customer can avail the facility of an overdraft or loan in need. An overdraft is one kind of facility provided by the banks to its customer. In an overdraft facility, a bank has permitted to withdraw the money to do the transactions. When the balance of an account holder goes below zero, a customer can use this facility. 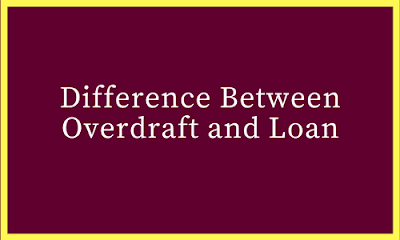 An overdraft limit is drawn by the bank it means a bank decides up to which limit an amount to give as an overdraft. In overdraft, a time limit by which an amount must be debited to the bank and that is also decided by the bank. To avail an overdraft facility, the client must have a current account in the bank. An overdraft facility depends on the customer's credit, eligibility and transactions a bank charges an interest on that. When the negative balance exceeds the agreed conditions, a higher rate of interest is applied. A Loan is a money which can be borrowed from a bank or any financial institutions. So, a loan is fixed amount of credit given to the client by the bank for a pre-determined period. A loan is always for some specific amount, time and for a specific interest rate. A loan is repaid in instalments along with the interest applicable in a future. If a customer fulfils the eligibility criteria then only a loan will pass. A loan is given against some security provided by the customer to the bank, a security may be a property, gold, etc. If in case a creditor fails to pay the money a debtor can use this security to cover the loan amount. A loan is a lending of money by the bank to an individual or an entity. A loan is one kind of debt given to the customer for a certain period of time. An overdraft facility is provided by the banks. A loan is borrowed by the customer from the bank. An overdraft is for a short period of time. A loan is for a longer period of time. An overdraft facility is generally used by the company to run their day to day transactions. A loan is borrowed by both an individual and business entity also for long term purpose. An interest is just charged on the amount overdrawn. In a loan, an interest is charged on the whole amount. In overdraft, an interest is payable by depositing money in bank account. In a loan, a repayment is done by EMIs. An interest is calculated on a daily basis. An interest is calculated on monthly basis.